Even those who do not know me personally can affirm the trivia that the potato ranks first in my list of favorite food. If you're surprised, you are most likely unaware of what the spud offers. Potatoes somewhat mirror my personality. Its outside look doesn't truly define whats inside. Many are misled about the benefits of this tuberous crop because of its texture and form. But just like books, don't judge potatoes by its cover. What I like about potatoes is its appealing color, appetizing texture and most importantly, its delicious taste. And oh yeah, health benefits. The potato is also very easy to prepare, absolutely easy to find, is cheap and has a place in both casual and fine dining! It's quite sad that most people only know two dishes that potatoes make out of: fries and mash. Boy, they don' t know what they're missing! If you're the kind of person who doesn't like potatoes, you haven't tasted the ones from the United States Potato Board! 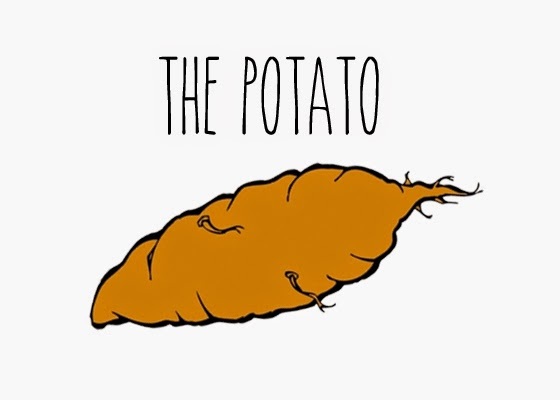 The United States Potato Board (USPB) is America’s potato marketing and research organization. Based in Denver, Colorado, the USPB represents more than 2,500 potato growers and handlers across the country. The USPB was established in 1971 by a group of potato growers to promote the benefits of eating potatoes. Today, as the largest vegetable commodity board, the USPB is proud to be recognized as an innovator in the produce industry. My y appreciation for potatoes grew higher when I purposely tried the potato-based dishes of some restaurants in town that source their potatoes from USPB. One in particular was Friends Fries. In terms of moisture content, US fries have less moisture and higher solids, resulting in a crisp exterior and fluffy interior. Moreover, US fries have the right mix of starch and natural sugars that produce visually appealing fries: crisp, nutty and robust on the outside, yet tasty and fluffy in the inside. Why use US Frozen Potatoes? High Quality Raw Product. Ideal growing temperatures, rich soil, state-of-the-art processing facilities and generations of expertise make US frozen potatoes the finest in the world. US potatoes destined for processing must contain high “solids” and low sugar content, which are important characteristics for achieving a finished product with desirable appearance, taste and texture. US potato growers offer processors high-quality potatoes from a plentiful year-round supply. US industry standards are demanding and meet all Food and Drug Administration and USDA specifications, enabling US processors to create top-quality and safe frozen potato products. Nutrition. Potatoes, beloved by people around the world, are an indispensable source of nutrition in any balanced diet. One 148 gram potato packs only 110 calories, but 18% of the RDV (recommended daily value) of potassium and 45% of the RDV of vitamin C. Frozen potatoes products are instantly quick frozen to lock in the taste and nutrients of fresh potatoes, yet maintain a much longer shelf life. Quality. Not all potatoes are created equal. Quality can vary greatly so in order to get maximum servings per case, request the highest quality varieties when purchasing frozen straight cut fries. Look for the "Extra Long" or "Extra Long Fancy" designation on the packaging. For complete USDA quality standards go to United States Standards for Grades of Frozen Fried Potatoes. Variety. US frozen processors offer the widest variety of menu-enhancing frozen potato products from which to choose. From whole frozen baked potatoes to specialty fry products, US frozen potatoes are appropriate for breakfast, lunch, dinner, or as a snack. Specialty cuts provide more servings per case, because their shapes take up more space on the plate. Specialty cuts allow a restaurant to distinguish itself from the competition. They are also conducive to the development of new and different recipes. USPB offers a wide range of potato-bilities to the Philippine food industry by providing healthy, tasty, innovative and easy-to-make products every chef or restaurateur will love such as the US frozen potatoes. Beginning January 1 to March 31, 2015 restaurants The Suite Room, Circa 1900 and Anzani Mediterranean Cuisine will be offering new potato-inspired dishes to satisfy the stomachs of Cebuanos who have been craving for the crop and finally, to those who haven't tried it, to discover the festive experience the vegetable offers. Fore more details about US Potatoes, click these links USPB USDA.